Located a walk away from major shopping and tourist hot spots, today's hotels present themselves as ideal meeting points or pit stops before proceeding into the urban jungle of Bangkok. Electronic gadgets are always within the reaches of omnipresent rays of Wi-Fi, ensuring work is never left alone in the abyss of digital inboxes. 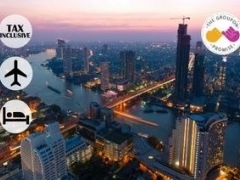 Within the hotel's relaxing surroundings, guests may take a break from taking in the sights, sounds and smells of Bangkok without actually being too far from the thriving city center..
Be prepared to be all smiles as you begin your gallivanting around the Land of Smiles, relishing the unique city retreat Bangkok alone has the power to offer. Visit cultural landmarks such as the much revered 4-Faced Buddha shrine, located at the heart of Bangkok's shopping district, and then head off to spend some of that hard-earned cash in bountiful, rewarding ways. Unearth the buried guilty pleasures at Bangkok, where it is almost considered sacrilege if you do not hop down to the shopping stalls lined up at Chatuchak Weekend Market. Featuring countless stalls, offering everything from clothing, accessories, books, and furniture to pet supplies and home decor items, Chatuchak is every shopper's dream come to life. Unload the bulging shopping bags and ensconced into a massage chair for a traditional Thai Massage to ease the retail fatigue away. With a fresh mind and pair of legs, seek out the best Thai food in town and slurp through a plate of scrumptious Phad Thai or a bowl of spicy Tom Yum soup for a complete meal.